Call me fickle, but I'm prone to love/hate relationships with certain types of polish. Shard glitterss might top that list. 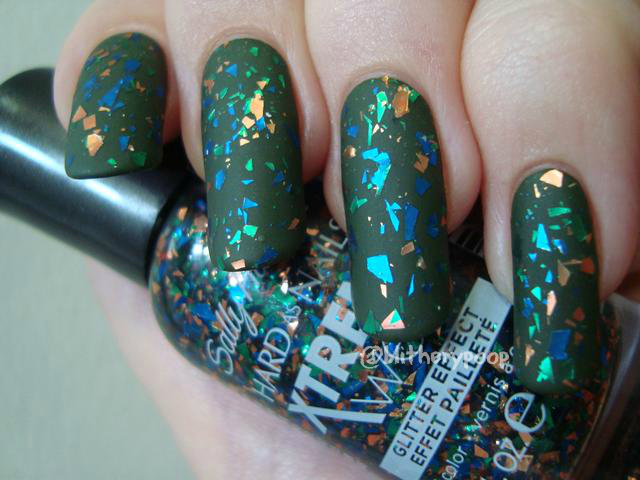 Few things in the polish world bug me as much as thinking I see an iridescent flakie only find out it's shards. Revlon's Moon Candy duos are perfect examples. I'd have been all over them if they were flakies. Flakies lay flat against the nail, but shards often have a nasty habit of sticking up. I even cut my lip on one once. I'm incredibly leery of them...and yet...they're so....shiny. If I could resist shiny things, this blog wouldn't exist. 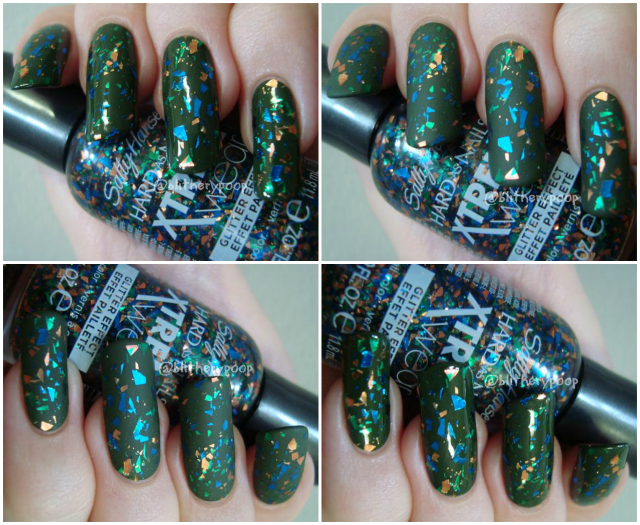 So when I saw Sally Hansen's new Create & Ornate collection on Nouveau Cheap, I clenched my fists in shard rage. [Ok, who am I kidding? I can't make a fist. My nails are too long. You know what I mean though.] Then I saw it at my favorite CVS on Sunday. One of the four shard toppers is blue, gold, and copper. Ooooh! Why must they tempt me like this? I caved, of course. 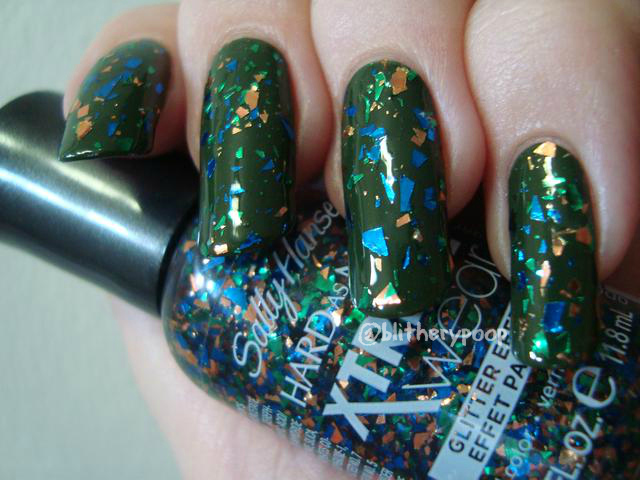 Mind Your Manors has a clear base with irregular mylar shards in blue, green, and copper. Ok...I love it. I haven't been this hesitant to buy a polish in a while, and not just because of my feelings about shards. 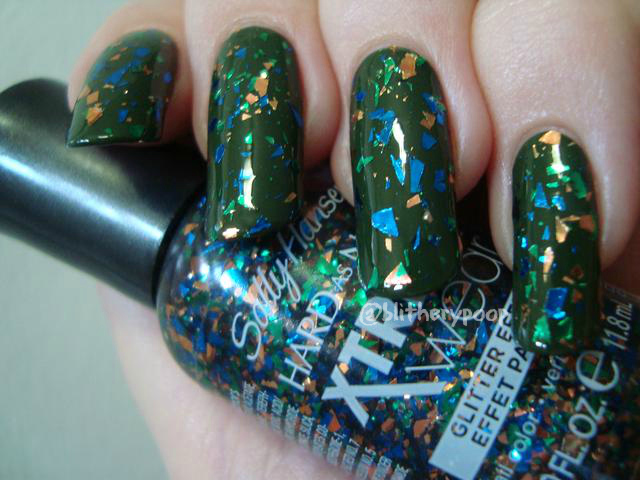 When Sally Hansen reformulated the Xtreme Wear line, they kinda ruined the glitter base. They must have used a different base for the new shard glitters because Mind Your Manors applied just fine. Phew! And it's not excessively poke-y either. Metallic shards seem a little softer and thinner than the iridescent ones and these lay pretty flat to the nail. I used Gelous for extra smoothing, but 2-4 coats of topcoat would also work. Not bad as these things go. Gotta see it matte too, right? Even better...and even smoother! Bottom line: Better than expected, in every way. Not sharp and hard to smooth, and the application is also decent. I might even go back for one or two of the others. Do you have a love/hate thing with any polish finishes? Matte all the things ! Anything that requires 2-4 (I dont mind 2) coats of topcoat is an automatic side-eye for me. It does look really great tho ! I saw these the other day and admired them but remembered how sad the last glitters SH put out were so I scoffed and walked away, lol.